August 1, 2016This recipe is a classic for a reason. Find some onions and forget about everything while enjoying one of the most comforting dishes ever devised. This recipe is an absolute classic, and for good reason. It requires few ingredients and a little attention, but the reward is easily worth it. Especially on a cold winters night when you can sit down and forget about everything while enjoying one of the most comforting dishes ever devised. As far as ingredients, as always, use the best you can find. Ordinary yellow onions work best with red or white not quite as rich, but not exactly a disaster. A quality beef stock will elevate it to legendary status, but it is still well worth it even if you only have stock cubes. You can take an hour or two caramelising tho onions over a nice low heat, but a pinch of baking soda will allow you to do it in less than half the time over a high heat if you pay attention. Just remember to keep the onions moving every few minutes and if there are any signs of burning just add a splash of water to calm things down a bit. You can serve the bread on the side, but I find the cheesy crouton soaks up so much flavour it wouldn't be quite right to leave it stranded alone waiting to be dunked. Melt the butter in a large saucepan over a high heat. Add the olive oil, onions and baking soda and stir. Continue to stir every few minutes as the onions caramelise and go dark brown. This can take 20 - 40 minutes, but they should be a bit darker than golden and not black or burnt at all. Add the flour and thyme and stir for 2 minutes. Pour in the brandy and vinegar and stir until absorbed. Add half of the beer and gently scrape the pan to release any flavourful crust sticking to the bottom. Add the remainder of the beer and the stock and simmer gently for 15-20 minutes minutes. Check the seasoning and add some salt, pepper and a dash of Worcestershire sauce to taste. Turn on the grill and lightly toast each slice of bread on both sides. Rub on one side with a cut clove of garlic. 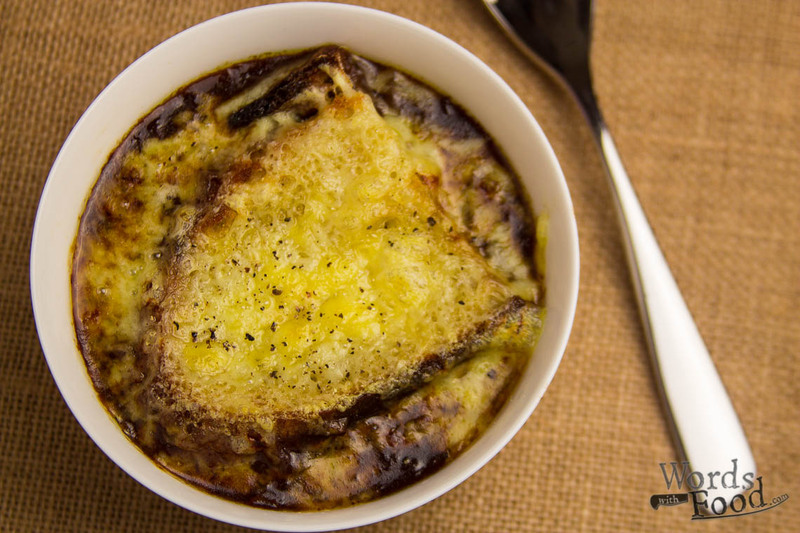 Ladle the soup into bowls and place the bread on top, scatter over the grated cheese and place under the grill until melted, bubbling and just starting to brown in places. Serve immediately.